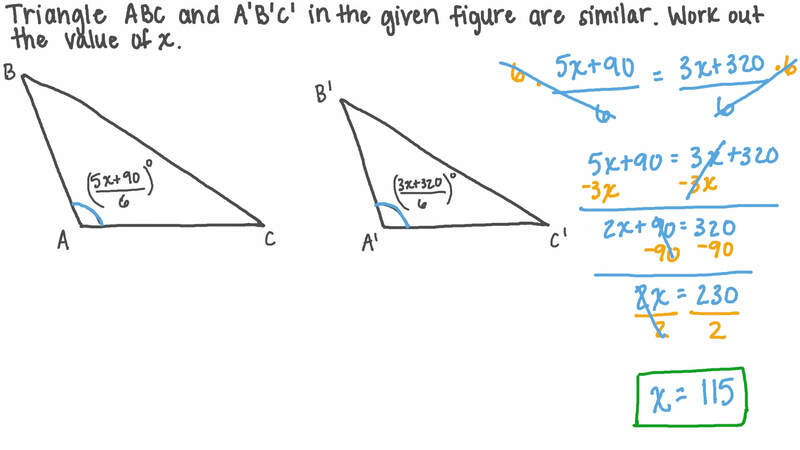 In this lesson, we will learn how to identify similar triangles. In the given figure, 𝐴 𝐵 and 𝐷 𝐸 are parallel. Using the 𝐴 𝐴 criterion, what can we say about triangles 𝐴 𝐵 𝐶 and 𝐷 𝐸 𝐶 ? D They are equilateral triangles. E They are neither similar nor congruent. Given that 𝐴 𝐵 and 𝐷 𝐶 are parallel, are triangles 𝐸 𝐶 𝐷 and 𝐸 𝐴 𝐵 similar? If yes, why? B Yes, as all the corresponding angles in each triangle have equal measures. C Yes, as the side lengths are equal. The two triangles in the given figure have equal angles. Is this enough to prove that the two triangles are similar? Two triangles are similar. What will be true of the measures of the corresponding angles in the two triangles? A They will be equal. BOnly two corresponding angles will be equal. C They will be different. D If the sides are equal, the angles will be equal. E Only two corresponding angles will be equal. Two quadrilaterals have corresponding angles that have equal measures. Can we be sure that the quadrilaterals are similar? Triangles 𝐴 𝐵 𝐶 and 𝐴 ′ 𝐵 ′ 𝐶 ′ in the given figure are similar. Work out the value of 𝑥 . 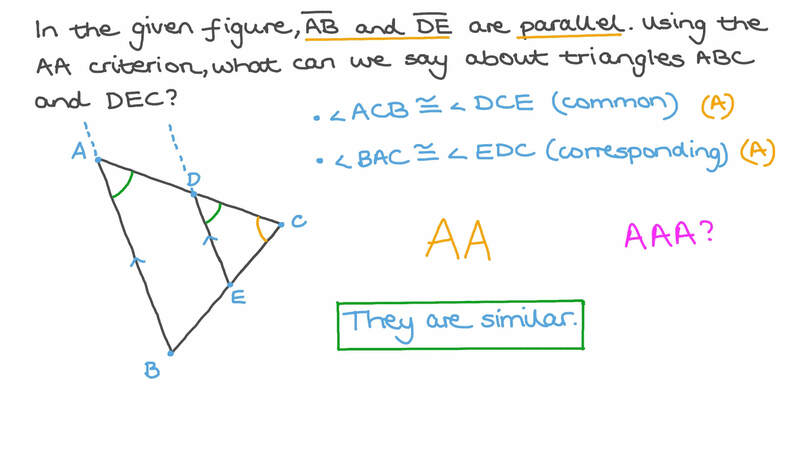 What does the AA criterion for triangles allow us to prove? A If two corresponding angles in two triangles have equal measures, then they must be similar. BIf, in the two triangles, one pair of corresponding sides are proportional and the included angles are equal, then the two triangles are similar. C If the corresponding sides of two triangles are proportional, then the two triangles are similar. D If the corresponding sides of two triangles are equal, then the two triangles are congruent. E If a corresponding side and angle are equal in two triangles, then the two triangles are similar. The figure shows two triangles: and . What does the criterion tell us about these two triangles? AAs both triangles share two angles of equal sizes, they must be similar. BAs both triangles share two angles and two sides of equal sizes, they must be similar. CAs both triangles share three angles of equal sizes, they must be similar. DAs both triangles share one angle of equal size, they must be similar. EAs both triangles share two sides of equal sizes, they must be similar. AAs both triangles only share one angle of equal sizes, they are not similar. BAs both triangles only share two sides of equal sizes, they are not similar. CAs both triangles only share two angles of equal sizes, they are not similar. DAs both triangles only share three angles of equal sizes, they are not similar. EAs both triangles only share one side of equal sizes, they are not similar. The figure shows three triangles: 𝐴 𝐵 𝐶 , 𝐴 ′ 𝐵 ′ 𝐶 ′ , and 𝐴 ′ ′ 𝐵 ′ ′ 𝐶 ′ ′ . B Triangle 𝐴 𝐵 𝐶 can first be rotated 9 0 ∘ clockwise about 𝐷 onto 𝐴 ′ 𝐵 ′ 𝐶 ′ , and then 𝐴 ′ 𝐵 ′ 𝐶 ′ can be dilated from point 𝐷 by a scale factor of three onto 𝐴 ′ ′ 𝐵 ′ ′ 𝐶 ′ ′ ; hence, the triangles are similar. In the given figure, 𝐷 𝐸 is constructed on the triangle 𝐴 𝐵 𝐶 parallel to 𝐵 𝐶 . What can we conclude about the size of angles 𝐴 𝐷 𝐸 and 𝐴 𝐵 𝐶 ? Using the 𝐴 𝐴 criterion, what can we conclude about triangles 𝐴 𝐷 𝐸 and 𝐴 𝐵 𝐶 ? EThey are neither similar nor congruent. The figure shows two triangles. AThe triangles do not share the same angles and, hence, are not similar. BIf you calculate the measure of the third angle in one of the triangles, you can see that the triangles share two angles; therefore, by the 𝐴 𝐴 criteria, the triangles are similar. Which angle is equivalent to ∠ 𝐴 𝐵 𝐶 ? Give reasons. A ∠ 𝐴 𝐷 𝐸 , because the angles are corresponding. B ∠ 𝐴 𝐶 𝐵 , because the angles are corresponding. C ∠ 𝐴 𝐷 𝐸 , because the angles are alternate. D ∠ 𝐴 𝐸 𝐷 , because the angles are corresponding. E ∠ 𝐴 𝐶 𝐵 , because the angles are alternate. Which angle is equivalent to ∠ 𝐴 𝐶 𝐵 ? Give reasons. A ∠ 𝐴 𝐸 𝐷 , because the angles are corresponding. B ∠ 𝐴 𝐷 𝐸 , because the angles are alternate. C ∠ 𝐴 𝐸 𝐷 , because the angles are alternate. D ∠ 𝐴 𝐷 𝐸 , because the angles are corresponding. E ∠ 𝐴 𝐵 𝐶 , because the angles are corresponding. Hence, are triangles 𝐴 𝐵 𝐶 and 𝐴 𝐷 𝐸 similar? If yes, state why? AYes, they are similar by the AA criterion. BYes, they are similar by the SSS criterion. DYes, they are similar by the SAS criterion. A ∠ 𝐶 𝐸 𝐷 , because the angles are alternate. B ∠ 𝐷 𝐶 𝐸 , because the angles are vertically opposite. C ∠ 𝐶 𝐸 𝐷 , because the angles are corresponding. D ∠ 𝐶 𝐷 𝐸 , because the angles are alternate. E ∠ 𝐶 𝐷 𝐸 , because the angles are corresponding. Which angle is equivalent to ∠ 𝐵 𝐴 𝐶 ? Give reasons. A ∠ 𝐶 𝐷 𝐸 , because the angles are alternate. C ∠ 𝐶 𝐷 𝐸 , because the angles are corresponding. D ∠ 𝐶 𝐸 𝐷 , because the angles are alternate. E ∠ 𝐶 𝐸 𝐷 , because the angles are corresponding. Hence, are triangles 𝐴 𝐵 𝐶 and 𝐶 𝐷 𝐸 similar? If yes, state why? Triangles 𝐴 𝐷 𝐸 and 𝐴 𝐵 𝐶 in the given figure are similar. What, if anything, must be true of the lines ⃖     ⃗ 𝐷 𝐸 and ⃖     ⃗ 𝐵 𝐶 ? Given the following four shapes, which two are similar? The triangles, therefore, share the same angles and are similar. What is the fewest number of angles needed to determine whether two triangles are similar? What is the fewest number of angles needed to determine whether two triangles are similar? Are the two triangles in the figure similar?